The winner of this evening’s drawing in booth #1003 at RMEF’s Hunter & Outdoor Christmas Expo was Joelle Chee-Arviso. Joelle gets her choice of a two-pack of Rutting Ridge Cabernet Sauvignon or a limited-edition, numbered print of any of our four original watercolor paintings. Congratulations, Joelle! The winner of this evening’s drawing in booth #1003 at RMEF’s Hunter & Outdoor Christmas Expo was Diana Verville. Diana gets her choice of a two-pack of Rutting Ridge Cabernet Sauvignon or a limited-edition, numbered print of any of our four original watercolor paintings. Congratulations, Diana! 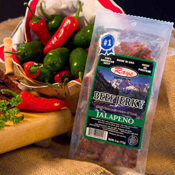 Ray’s Good Stuff offers beef, elk, and buffalo jerky. There’s barbeque, peppered, jalapeno, teriyaki . . . quite the variety. Most of all though, the stuff is just what both David and Ray say it is—really good! Full of flavor. A pleasure to chew. Downright delicious! What’s really fascinating is how a guy in commercial real estate got into the jerky business. Actually, it’s simple. Ray loves to cook, barbeque, and coincidentally, hunt. Ray just took what he did in the backyard and decided to make it into a business. And if you like to hunt like Ray does, then take his jerky along on your next outing. Some of those hunts take a lot of patience, and a fella can get mighty hungry. Cheers to you Ray! You walk the walk, and talk the talk. Really good stuff! You can learn more at raysgoodstuff.com. The winner of this evening’s drawing in booth #1003 at RMEF’s Hunter & Outdoor Christmas Expo was Mike Bowers. Mike gets his choice of a two-pack of Rutting Ridge Cabernet Sauvignon or a limited-edition, numbered print of any of our four original watercolor paintings. Congratulations, Mike! Life started in New Jersey for Mike Legowski, owner/operator of the Elfin Cove Resort in Alaska. But at the age of 10, his dad moved from Jersey to Seattle. Following high school graduation some eight years later, Mike went to work learning the ropes in the construction business. It was when a family friend asked him to build a lodge in Alaska that the landscape would eventually change. That friend got into financial trouble during the build-out process, and Mike saw an opportunity. He promptly bought the property and became a lodge owner. That was some 15 years ago. Mike’s next move was to venture-up. 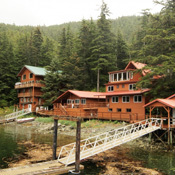 Taking note of the abundant fishing in the area, specifically halibut and salmon, the Elfin Cove Resort was born, featuring adventure fishing in Alaska. Eleven years later and after purchasing another lodge next door, which was painted and touched up to match the surroundings, Mike now has 200 slots he can fill each year with fishermen. Today, Mike’s Elfin Cove Resort is one of Alaska’s premier fishing lodges, offering charters, sightseeing, and wilderness adventures. In addition to fishing alongside expert boat crews, guests can also spend their days hiking nearby trails or sightseeing. A short boat ride could have you bathing at White Sulfur Springs, flying through the treetops on a zipline, or hiking on an island in search of an old military outpost. The winner of this evening’s drawing in booth #1003 at RMEF’s Hunter & Outdoor Christmas Expo was BJ Richardson. BJ gets his choice of a two-pack of Rutting Ridge Cabernet Sauvignon or a limited-edition, numbered print of any of our four original watercolor paintings. Congratulations, BJ! In the outfitting business, husband and wife teams passionate about hunting and conservation are just hard to beat. That’s the case with Bill and Renita Brown who own and operate Chase Hill Outfitters in Big Sandy, Montana. The Browns offer a hunting experience that’s second to none in Big Sky Country on the edge of the wild and scenic area where Lewis and Clark traveled more than 200 years ago. Montana hospitality is the hallmark of the Browns—Bill, with his engaging conversations about Montana lore and Renita, who’s a bundle of energy tending to the needs of their hunting guests who always marvel at the comfort of the lodge on their ranch. Repeat clients feel like they’re coming home when the hunting season starts, and new clients become quickly impressed with their experience. The Browns operate their business in one of the most famed mule deer, whitetail deer, bighorn sheep, and antelope hunting regions in the world, the Montana Missouri River Breaks. They offer fully guided hunts on about 100,000 acres of private ranch land and have permits on more than a million acres of federal land. The season begins with their “varmint safaris:” prairie dogs, ground squirrels, coyotes, raccoons, and badgers. These hunts book up quickly with many of their repeat clients and friends. When fall rolls around, the operation moves into bird hunting. Opportunities are abundant for hunting sharptail grouse, sage grouse, Hungarian patridge, and ringneck pheasant. 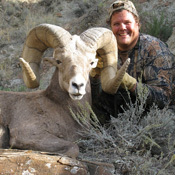 The fall highlight features the big fellows: mule and whitetail deer, bighorn sheep, and antelope. You can meet the Browns in person at this year’s RMEF Hunter & Outdoor Christmas Expo. Stop by booth 1314 and say hello. The winner of this evening’s drawing in booth #1003 at RMEF’s Hunter & Outdoor Christmas Expo was Ashley Becker. Ashley gets her choice of a two-pack of Rutting Ridge Cabernet Sauvignon or a limited-edition, numbered print of any of our four original watercolor paintings. Congratulations, Ashley! It’s the people that make any business, particularly in the service industry—and even more so in the “outfitting” business. Outfitters are a breed that provide up-close and personal experiences. The time you spend with them is not only a hunting and outdoor experience, it becomes akin to a family outing. As the client, you depend on them for guidance, knowledge, and most of all, results. 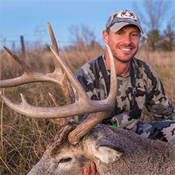 Red Dog Outfitters (RDO) owner Tim Clark and his team are great examples of what a hunter should look for in selecting an outfitter. Tim, with 20-plus years of experience hunting waterfowl, big game, and everything in between, found himself several years ago in the middle of a prime property that was up for lease. He jumped on the opportunity to get back in the hunting business—this time as an outfitter and not the club side of the biz, in which he had previously engaged and discovered obstacles galore. Patricia Clark, a native Arizonian and a member of the RDO family, has transitioned her serious passion for fishing to include hunting. In the course of things, she took to archery and has become quite the shot. But more importantly, if you go on a guided trip with RDO, you’re sure to enjoy some good eats. The lady can cook. Whether it’s whitetail meatloaf, chicken enchiladas, lasagna, or pizza, she can throw down with the best of them. The newest member of the RDO guide team is Jordan McFall. Hunting and fishing knowledge, combined with years of experience, are his calling cards. Originally from Texas, Jordan grew up in Colorado, where he’s been on the hunt or in a boat since he was big enough to hold a gun or drop a line in the water. Clients quickly learn to appreciate Jordan’s hunting techniques, whether it’s chasing elk and mule deer in the high country, belly crawling after skittish whitetail deer and antelope on the plains, or calling in flocks of ducks and geese. You can visit Red Dog Outfitters at RMEF’s Hunter & Outdoor Christmas Expo in the Las Vegas Convention Center through December 12. The winner of this evening’s drawing in booth #1003 at RMEF’s Hunter & Outdoor Christmas Expo was Leonard Howells. Leonard gets his choice of a two-pack of Rutting Ridge Cabernet Sauvignon or a limited-edition, numbered print of any of our four original watercolor paintings. Congratulations, Leonard! We discovered some truly unique wine-related items at this year’s RMEF Hunter & Outdoor Christmas Expo on the second floor of the Las Vegas Convention Center. Well, we actually discovered them at the NFR Cowboy Christmas Gift Show on the floor below—a floor that’s jam-packed, we might add. Elbow-to-elbow is the best way to describe the bedlam down there. D-Patt Wine Bottle Stoppers is one of those little family-owned, Texas-based operations that demonstrates craftsmanship is still alive and well in the good old USA. From a small workshop behind their house in 1990, the owners started making and selling their wares. Nowadays, they travel the show circuit, selling their wine bottle stoppers to people from hither and yon. According to the company’s website, more than “100 different types of exotic woods, including purple heart, goncolo alves, king, and zebra, as well as all types of antler and iron” are used in their one-of-a-kind, made in America” stoppers. 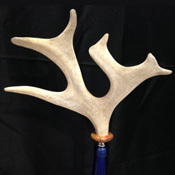 As a proud RMEF corporate sponsor, we were particularly fascinated with D-Patt’s antler-style bottle stoppers. Axis deer, fallow deer, and large whitetail deer antlers are used to perfection in creating really distinctive stoppers that make terrific gifts for many occasions (hunters and hunters’ wives, take note). Wooden wine bottle stoppers also caught our fancy. Turned on a lathe, these stoppers have been created in many intricate shapes, designs, and colors. But don’t take our word here. If you’re in and around the Las Vegas Convention Center from now through December 12, stop by and take a look. Chances are you’ll find something you want to take home. The winner of this evening’s drawing in booth #1003 at RMEF’s Hunter & Outdoor Christmas Expo was Renita Brown. Renita gets her choice of a two-pack of Rutting Ridge Cabernet Sauvignon or a limited-edition, numbered print of any of our four original watercolor paintings. Congratulations, Renita! 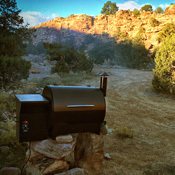 A must-see at this year’s RMEF Hunter & Outdoor Christmas Expo in Vegas is a visit to the Traeger Wood-Fired Grills booth. It’s a fine product that delivers what it preaches. And best of all, you don’t need to be a grilling or smoking king to turn out great food. Just adhere to the “Traeger method” of cooking, and it’s a cinch that your next door neighbor’s going to be hanging his head over your fence asking what’s up. That smoky aroma from the Traeger pellets will make your mouth water. The difference is those wood pellets and the superior smoking results they create. Traeger sources four U.S. mills that process pure hardwood, blended for the perfect balance of smoke to heat. These pellets are the pivotal ingredient that drive the design of the company’s grills. So swing by the Traeger booth in the South Hall of the Las Vegas Convention Center and introduce yourself. You’ll discover that the Traeger team takes “friendly” to another level, and their knowledge of smoking and suggestions for using their equipment will make your day. The winner of this evening’s drawing in booth #1003 at RMEF’s Hunter & Outdoor Christmas Expo was Mike Falk. Mike gets his choice of a two-pack of Rutting Ridge Cabernet Sauvignon or a limited-edition, numbered print of any of our four original watercolor paintings. Congratulations, Mike! An American elk hunt is one thing. An African safari for women certainly falls into the category of a lifetime experience. One of this year’s RMEF auction opportunities was a “sisters on safari for two” to be hosted by Bugle magazine’s Shooting Editor, Dr. Wayne van Zwoll, and Jamy Traut of Jamy Traut Hunting Safaris. The destination is central Namibia, and the trip is scheduled for late spring in 2016. 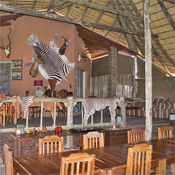 There are eight days of hunting in conditions that include deluxe safari tents/lodges, beds, private baths, meals, wine . . . in other words, you won’t be roughing it. All hunt transportation is via Land Cruiser. Ladies will be picked up at the Windhoek Airport for an exciting time, hunting species such as gemsbok, springbok, greater kudu, blue wildebeest, and warthog. 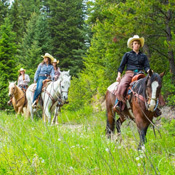 Wayne has played host to small groups of women from all over the U.S. on high-country adventure trips for 11 years. They get rave reviews—”Best experience ever!” “I’m hooked on hunting!” “Life changing!”—are just some of the reactions from women hunters. What’s really cool is that no hunting or shooting experience is required. Bring your own rifle or use one provided by the safari. Either way, “close stalking” assures a trophy—not to mention that Jamy Traut’s Panorama Camp impresses all hunters. Indian summer days with interesting locals will leave you with a lifetime memory. The winner of this evening’s drawing in booth #1003 at RMEF’s Hunter & Outdoor Christmas Expo was Karen Tallier. Karen gets her choice of a two-pack of Rutting Ridge Cabernet Sauvignon or a limited-edition, numbered print of any of our four original watercolor paintings. Congratulations, Karen! It’s not just a man’s world anymore when it comes to hunting. Karen Butler and Donna McDonald recognized that trend a few years back and started their “Shoot Like a Girl” hunting packages, one of which they donated to this year’s Ladies’ Auction at the RMEF Hunter & Outdoor Christmas Expo in Las Vegas. The winner of this evening’s drawing in booth #1003 at RMEF’s Hunter & Outdoor Christmas Expo was Andy Treharne. Andy gets his choice of a two-pack of Rutting Ridge Cabernet Sauvignon or a limited-edition, numbered print of any of our four original watercolor paintings. Congratulations, Andy! Please check out the news release that we and RMEF co-published on Wednesday. We’re delighted to be part of the RMEF family! What’s a “glamp” trip, you ask? Scott and Sandy Sallee of Black Mountain Outfitters in Emigrant, Montana, have coined this phrase. It’s their version of roughing it in the wilderness, or as some may call it, ladies night out. As a gesture of their generosity and support of the Rocky Mountain Elk Foundation, the Sallees donated a trip for four to one of RMEF’s auction sessions at this year’s Hunter & Outdoor Christmas Expo being held in Las Vegas from December 3-12. Here’s how it goes for this gal’s pack trip. You ride on horseback eight miles to a destination that includes carpet, sauna, and a hot shower. Full-course meals and comfortable cots accompany each evening’s stay. Each day starts with fishing pristine streams for rainbow trout and riding through incredible vistas and ends with a relaxing campfire evening. The Sallees provide a hands-on tour that celebrities like Clint Black and Red Steagall have enjoyed. Every effort is made to ensure that guests have the time of their life and a great memory to take back home with them. Hot showers on a campout, you’re thinking? Now that’s some serious pampering.